Although consumer psychology research on eating behavior is both theoretically and empirically rigorous and creative, it appears to have a shockingly small impact on public health and public policy. This may have to do with the way findings are organized and the way studies have conducted. This article has two purposes. The first purpose of this paper is to show how research can change food choices by using an organizing framework following the acronym CAN -- making healthy choices more convenient (physically and cognitively), more attractive (comparatively and absolutely), and more normal (actual and perceived). The second purpose of this paper is to introduce the notion of activism research – an approach that can be used to make consumer psychology and health psychology research more actionable, useful, effective, and scalable. Together these two tools could help expand both the relevance and reach of consumer psychology research. Behavioral scientists have been generating, testing, and publishing an increasing number of powerful insights in the area of food choice and eating consumption. Unfortunately, not enough of these insights make their way into effective public health interventions or treatments (Wansink and Chandon 2014). Indeed, many are unknown by the researchers, practitioners, and policy makers in public health (Casazza, et al 2014) because of at least three barriers. The first two relate to our research approach and the third relate to how we communicate our contributions. First, because of our training in consumer psychology, we often focus on internal validity over external validity (e.g., Vermeir and Van Kenhove 2005). That is, we conduct multiple lab studies while public health researchers conduct longitudinal randomized controlled trials (e.g., Xie, Bagozzi, and Ostli 2013). Second, we focus on theory building and mediation while public health focuses on behavioral outcomes (e.g., Nocella et al 2012). That is, we analyze interactions and conduct mediation analyses while public health focuses on objective biomarkers or actual consumption behaviors – such as food intake or changes in BMI). For instance, many psychology and marketing studies that focus on serving behavior or food choice are either overlooked or dismissed by public health because they only examine choice but not consumption or intake (Wansink and Johnson 2014). Although changing our research approach would not be an easy solution for most of us, there is a third barrier to impact that is much easier for us to address. It involves more clearly and cohesively communicating our contributions. To date, consumer psychology has not been able to provide public health with a systematic way to use the wide array of insights we have discovered. Many of our findings could appear disjoint or unconnected to someone outside the field (Hantula 2008). This is partially because the why array of dependent variables we focus on. For instance, in studying the impact of food names, a dozen researchers could its impact on a dozen outcome variables: memory, calorie estimate, choice, affect, behavioral intention to buy, consumption volume, and so on Hansen and Thomsen 2013). Similarly, our findings can also appear disjoint and unconnected because they use a wide range of seemingly vague or unwieldy independent variables (such as need for cognition or eating restraint) that cannot clearly be identified or easily manipulated by public health practitioners. Whereas individual difference variables such as need for cognition or eating restraint are meaningful for psychologists, they are often unusable by public health practitioners. In addressing this third barrier, this paper has two purposes. First, it aims to provide a basic categorization system that can help us systematize our findings in a way that makes them more useful to both public health researchers and practitioners. This basic framework focuses on interventions that change can change choice and do so by making healthy choices more convenient (physically and cognitively), more attractive (comparatively and absolutely), and more normal (actual and perceived). Consider the acronym CAN: Convenient, Attractive, and Normal. The second purpose of this paper is to provide a framework that can be used to make consumer psychology and health psychology research more actionable, useful, effective, and scalable. For researchers who are actively interested in having more of an impact in public health, it is a research framework they might be able to use to transition from a researcher to a research activist. While there are caveats, it offers direction for one’s first steps in this direction. 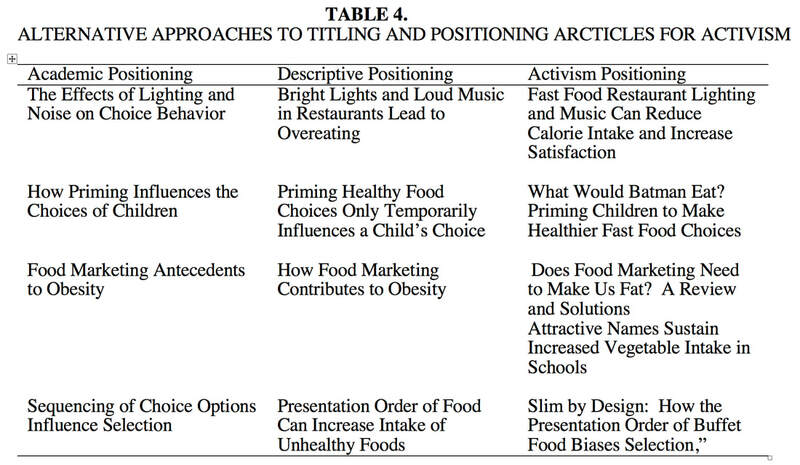 After discussing the CANapproach for changing eating behavior, this paper will define research activism and provide illustrations on how current food and eating behavior research projects might be adjusted to be more impactful in public policy and in public health. Last, an outline for potentially high impact research topics and approaches is offered as a possible direction for our field’s evolution in the area of eating behavior and health. Education and cognition is overrated when it comes to changing eating behavior. For instance, emotions and mood have recently been shown to bias both choice and intake regardless of whether they are positive or negative (Gardner, et al 2014; Atalay and Meloy 2011). There is a very unreliable link between knowledge and behavior, and relying only on education, knowledge, cognition, or willpower to change the eating behavior is discouragingly unsuccessful, leaving many public health programs to show small if any effects at often large costs (Casazza, et al 2014; Xie, Bagozzi, and Ostli 2013). With 95% of all diets failing within six months, it appears that it is very difficult to become slim by willpower. Fortunately, there is an alternative. Even though the typical person believes they make about 20-30 decisions about a food each day, they make closer to 200 food decisions (Wansink and Sobal 2007). About 90% of these decisions we are not fully aware of because they do note involve reason and deliberation. They involve quick, instinctive actions. This gives us a great opportunity to set up eating environments so a person’s quick, instinctive actions are biased toward the healthier foods – biased toward the apple rather than the cookie. In 2006, the New York State Department of Health raised the question, “How much would the government need to subsidize whole fruit in school lunchrooms so that children would take 5% more fruit?” A quick visit to five schools would have shown that these fruits were being sold in metal chafing dishes, under sneeze shields, in a dim corner of the line. The fruit’s 50¢price was probably not the problem and it probably would not be the solution: 1) Children did not know the price of the fruit, and 2) its purchase price would simply be deducted from the debit account that had been prepaid by their parents. Instead, the fruit needed to be put in nice bowls and placed in a well-lit part of the line. When this was done, fruit sales increased an average of 103% for the entire semester (Just and Wansink 2009). Putting the fruit in an attractive bowl in a well-lit part of the line would accomplish three goals. First, it made the fruit convenientto select. Second, it made the fruit appear more attractive. Third, it made it appear normal, typical, or reasonable to take fruit – partly because it was now convenient, looked more attractive, and did not look like the aberrant food to select. 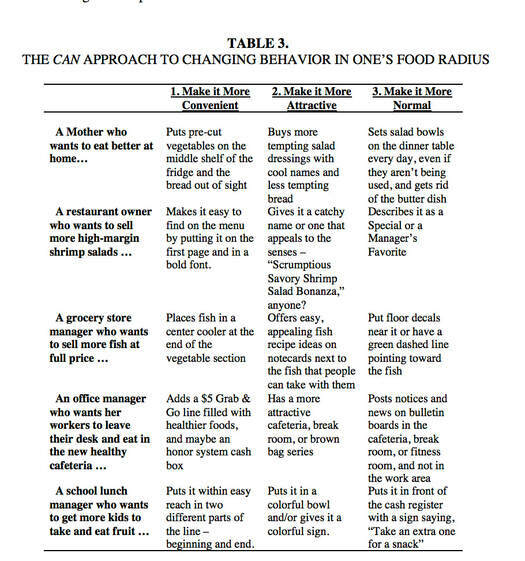 It was the CAN approach to changing behavior (Wansink 2014). In dozens of different eating behavior studies in homes, grocery stores, restaurants, and schools, this CAN approach can help guide parents, shoppers, restaurant goers, and students to select the healthier foods that are offered without having to necessarily change the foods themselves. The approach tries to make healthy foods appear to more convenient, attractive, and normal and has been shown to be much more effective than taking favorite foods away from or artificially restricting what someone can order (Hanks, Just, and Wansink 2013; 2014). Doing this creatively and effectively cannot only alter a person’s food choice, but it can alter expectations which can alter taste evaluation (Wansink et al 2012) and eventually lead to habitually healthier choices. Although these downstream ripples of one’s food choices are critical to changing habits and health, this review focuses on changing the choice that parents, shoppers, restaurant goers, and students make in the first place. 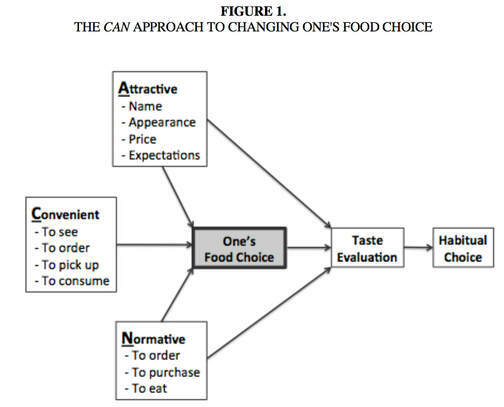 Using the CAN approach is less a process than it is a broad, action-based way of showing that many existing studies that focus on choice can be categorized by whether they are effective at making the healthy alternative more convenient to choose, more attractive to choose, or more normal to choose. It can also be used as a way to troubleshoot an unhealthy situation to determine what additional changes could be hypothesized, investigated, and implemented. Consider how widely the three can be conceptualized. As Figure 1 illustrates healthy choice needs to be made to be the convenient choice – convenient to see, to order, to pick up, and to consume. Consider what happens in schools that have adopted a behavior change program called the Smarter Lunchroom Movement. In one study, when one of the food lines in a school cafeteria was redesigned to be a convenient line that only offered pre-packaged healthy entrées and foods (such as salads), sales of these healthy foods increased 77% within two weeks (Hanks, et al 2012). Consider why 100-calorie packages have been so effective at reducing how of a food most people consume in one sitting (Wansink, Payne, and Shimizu 2012). One posited reason partially has to do with the inconvenience of opening a second or third bag (Hoegg and Alba 2007), and the convenience of being able to pause and ask “Am I really that hungry.” Making healthy food the more convenient choice, leads to greater choice. Making less healthy food the less convenient choice, leads people to more mindfully having to consider how hungry they are and whether it is worth the extra effort (Painter et al 2003). Convenience can be in the form of saving physical effort, but it can also take the form of saving cognitive effort, as Table 1 suggests. One often-cited technique to change behavior is to change defaults. For instance, if one is automatically given water with their combo meal unless they explicitly ask for a soft drink, water consumption would dramatically increase. While part of this might be explained by water being perceived as a more normal choice, another part of it is that it is the cognitively convenient choice to make. Technology – in the form of smart menu boards, personal menu profiles, or simply greater stylized information – could greatly alter or guide consumers to new choices by not only making healthier choices more cognitively convenient to make but also making them more convenient to visualize and consider (Lowe, Souza-Monteiro, and Fraser 2013). The second principle of the CAN approach is that the healthy choice needs to be made to be more attractive relative to what else is available. This includes more attractively named, more attractive in appearance, more attractively priced, and more attractive expectations (Vega-Zamoro, et al 2014). Fruit that is served in a steel chafer pan or stored in the bottom drawer of a refrigerator is not as attractive as fruit in a colorful bowl. Even simply giving food a descriptive name makes it more attractive and increases a person’s taste expectations and enjoyment of it (Wansink, Just, Payne, and Klinger 2012). For instance Dinosaur Trees are more exciting to a child and taste better than broccoli, and a Big Bad Bean Burrito tastes better and is more exciting than when it is called a Vegetarian Burrito. Even putting an Elmo sticker on apples led 46% more daycare kids to take and eat an apple instead of a cookie (Wansink, Just, and Payne 2012). Making a food more attractive by altering its price relative to other options is a popular but overused tool of behavioral economists, taking the form of taxes, subsidies, rebates, combo-deals, cents-off, coupons, and so on (Nies and Natter 2012). Still, it has potential if more creatively employed for it can involve not only altering the price of the target product (decreasing the price of fruit), but altering the price of nontarget products (increasing the price of cookies). Making a healthy food more attractive by adjusting price has creatively been done by offering people either a discount on a meal or a price premium on a less healthy one. Attractive and descriptive names not only raise the salience or awareness of the food (Cardello, 1996), but they also raise one’s taste expectations (Wansink and Park 2002; Tuorila, Meiselman, Cardello, & Lesher, 1998). The resulting confirmatory sensory bias, has been shown to lead people to “taste what they expect. Attractive packaging, descriptive names, color, labels, and appearance have all been shown to bias evaluations of taste (Tuorila, Meiselman, Bell, Cardello, & Johnson, 1994; Cardello, 1996; Francis, 1995; Tuorila, Meiselman, Cardello, & Lesher, 1998). As Figure 1 illustrates, in addition to changing the name of a food and enhancing expectations of taste or enjoyment (Spence and Gallace 2011), making a healthy food more attractive can involve making it or its surroundings more visually attractive. Putting fruit in a nicer bowl leads children to take more and putting garnish near a salad makes people rate the taste as better (Wansink, Payne, and Painter 2014). There are a number of post-consumption food evaluation measures – such as satisfaction, quality, regret, value – that could be influenced by attractively plated and presented food. Perhaps the most relevant and important one for restaurateurs, new product developers, and food marketers is that of “willingness to pay”. That is, understanding how small changes to the peripheral cues around food can raise its value and lead consumers to be willing to pay more. One study that presented diners with brownies on paper plates, normal plates, and fine china plates, showed that the nicer plates increased taste ratings of the food and doubled the price people were willing to pay for it. (Wansink 2006). Indeed, a premium has been placed upon finding relationships between a food’s appearance and not only its taste, but also how much one is willing to pay for it (Garber, Hyatt, & Starr, 2002). Recently, there have also been new explorations into the less conscious ways that packaging can influence shoppers particularly children – and how such techniques might be used to better market healthier foods. A recent study examined whethercereal spokes-characters make eye contact with children versus adults, and does their eye contact influence choice? The results showed the average height of cereal boxes on the shelf for adult versus children cereals (48 versus 23-in.) and the inflection angle of spokes-characters’ gaze changed (0.4 versus -9.6 degrees), and a second study showed that eye contact with cereal spokes-characters increased feelings of trust, connection, and choice (Musicus et al 2014). While the eyes of a spokesperson might also be used to more effectively sell healthier food, specific care should be taken when such foods are focused toward younger children (Roberts and Pettigrew 2013). Last, many consumers often like what is popular – they like what they think is normal. This includes being more normal to order, to purchase, to serve, and to eat (see Table 1). Efforts that make the healthy choice appear to be the more normal or normal choice appear to make it more. For instance, when 50% of the milk in a cooler is white (versus chocolate), middle school students are nearly three times as likely to take a white milk than when only 10% is white. It seems like the normal choice. The same applies at home. When healthier food is placed on the front or middle shelf in a cupboard or refrigerator, it is more frequently taken and is rated as the more normal food to take – otherwise it would not be so convenient (Chandon and Wansink 2002). Until now, much of this discussion has focused on how convenience, attractiveness, and normalness influence choice. Also of interest is how they influence on much one consumes. In many cases there is a wide range to how much of a product a person can consume. A person may be quite content eating from 3-5 pieces of pizza for lunch and drinking from 12-16 ounces of cola without feeling overly hungry or overly full. Without a norm for how much pasta or potato chips one should consume, some people may unknowingly rely partly on past experience and partly on implied norms or consumption cues around them to determine the quantity or a range that is acceptable to consume. If people do not have personal standards, benchmarks, or rules of thumb about how much to serve themselves, they are often at the person of the consumption cues and norms suggested by nearby peripheral cues. While a powerful consumption norm that biases the self-serving and intake of food is plate size (Wansink and van Ittersum 2014), another powerful consumption norm cue is what other people are doing (Olsen and Mai 2013). There is a rich literature on mimicry and eating behavior which has shown that how much a person how much one eats is influenced by ones’ friends and in private settings (Hermans, et al 2012), and it is particularly strong among women (Hermans, et al, 2008; 2010; Romero 2009; Mori, Chaiken, and Pliner 1987). It has been posited that impression management (Pliner and Chaiken 1990; Mori, Chaiken, and Pliner 1987), ingratiation (Salvy et al 2007), extended dining times (Bell and Pliner 2003) could lead one person to be influenced by the intake of another (Robinson et al 2011). Indeed, McFerran, et al. (2010a) showed that people imitate the behavior of others like them and therefore that people with a regular weight are less influenced when the person serving herself before them was obese vs. not, and this even influences dieters (McFerran, Dahl, Fitzsimons & Morales 2010b). A second consumption cue that is often used to determine what size of a product to buy or how much to serve are cues such as the package size, plate size, and so on. 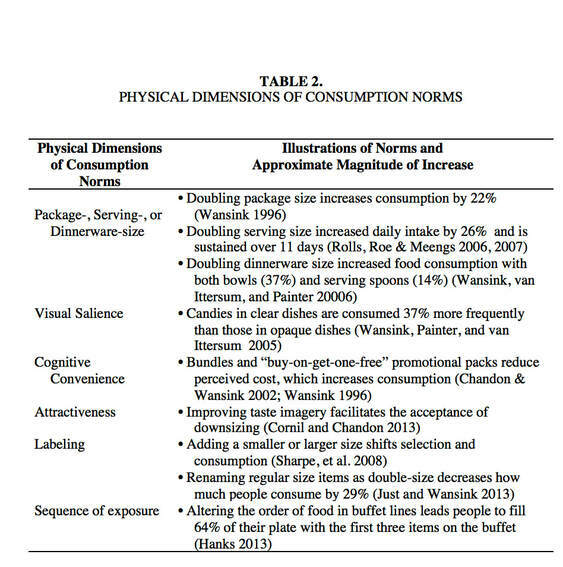 Consumption norms – particularly those resulting from implicit visual cues coming from physical dimensions (Table 2) – hold tremendous promise for researchers for three reasons: 1) Their reach is farther than has been appreciated, 2) they can be found in an endless number of forms, and 3) their perceptual nature makes consumers more vulnerable then they believe (Wansink 2014). From an intervention standpoint, changing the size of a cafeteria tray or the size label on a restaurant menu can change consumption in an automatic way that does not necessitate willpower or an expensive public health education campaign. Most consumer psychology insights related to food are relevant to one or more of the five places in our food radius where people either purchase or consume food: their home, their weekly grocery store, the two or three “go-to” restaurants where they eat at most frequently, where they work, where their kids go to school. For the typical person, 80% of what they buy or eat occurs within five miles of where they live. Knowing this can provide a framework of not only how research insights can be organized for action, but also who the most relevant dissemination partner should be. ​ Part of the influence consumer psychology research can have on public health and public policy is to more clearly show how the research we have conducted can specifically change behavior. The second way consumer psychology can have influence lies in how we view our research from the outset. Thinking like a research activist might be a promising first step in conducting research that transforms behavior. Consumer psychology researchers are each internally motivated for many reasons: curiosity, the thrill of discovery, ego-gratification, career flexibility, and so on. Many might also like to think their research is making a difference outside of academia – one that changes the conversation or it has a real impact on consumer welfare, company effectiveness, or public policy. Unfortunately, the training and mentoring most of us received as doctoral students gave us no real direction about how to make this happen. This may have led us to hope our research will eventually have an impact (Shimp 1994), thinking it will slowly be disseminated through consulting, teaching, and textbooks (see Figure 2). In this manner, we can comfort ourselves that our findings – if relevant – will eventually influence the lives of others without us actively trying to purposefully design them for impact or to actively seek dissemination partners. Such a model is appealing because it gives us two reassurances many of us want to believe: 1) our research findings would eventually be recognized and have a wide-ranging impact we could not begin to imagine, and 2) we did not have to do extra work for this to happen. In 1994, our consumer psychology community believed this was enough – our thoughts would move from articles to books to students to practice. In 1994, that was a start, but some people in the field today believe we can have a bigger and more immediate impact (Mick 2005; Keller 2008). Activism research argues for a more direct, assertive path to translation. ​ As a caveat, activism research has risks. It takes time and energy that could otherwise be dedicated to producing more findings and more insights. It takes a reputational risk that some might believe its focus on implementation might over-simply findings that are less straightforward. It takes a implementation risk that insights might be misapplied before we know moderating influences and boundary conditions that could cause unintended consequences. These caveats need to be considered before determining whether a particular project is at a maturity level to merit being translated into research activism. This paper underscores that there are two aspects to translational research. The first is in engineering our research so it has the best potential to be translated. The second is enlisting outreach partners that can make it translate. Activism research is research the authors intend to make a difference before they even begin. If everything works according to plan, it will change a target population. It is started with the intention that the final product – should it evolve as expected – will change the behavior of a target population. Research activism focuses on actionable, solution-oriented variables that will initiate, clarify, or balance a critical debate. It is then aggressively disseminated with the dominant purpose of influencing behavior among a targeted group of stakeholders. 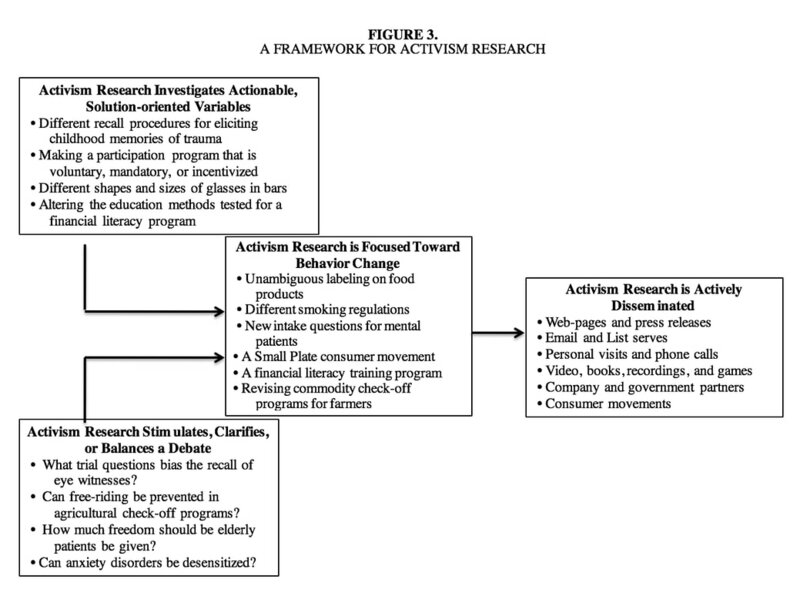 To be clear, there are four components to activism research: 1) It investigates actionable solutions, 2) it initiates, clarifies, or balances a debate, 3) it focuses on changing behavior, and 4) it is aggressively disseminated. Figure 3 illustrates different examples of these components, and they are explained in more detail below. 1. Activism Research investigates actionable solutions. Many Ph.D. programs in the social sciences train scholars to think in terms of broad generalizable constructs (such as self-efficacy, the need for cognition, or product involvement) and distinctions (individualistic vs. collectivistic or prevention- vs. promotion-focused). Yet the blessing of this training is also its curse. Because the constructs and theories we often strive to develop are general, they are often toogeneral to be well suited to activism research. Good activism research is conceptually rigorous, but it operationalizes constructs in actionable, targetable, solution-oriented ways. 2. Activism Research initiates, clarifies, or balances a debate. Most debates or disagreements about eating behavior often have assumptions or overlooked issues that can be introduced, proven, clarified, or made more vivid through research (Tarkianen and Sundqvist 2009). In other cases, activism research can serve to slow down a bandwagon effect (Phillips and Hallman 2013). For instance, Marion Nestle’s empirical work documented the dramatic rise in portion sizes (Young and Nestle 2002) and helped slow down the “personal responsibility” bandwagon of obesity by showing that the industry trend of “supersizing” portions companies made it increasingly easy for consumers to overeat. 3. Activism Research focuses on changing behavior.Activism research begins with the end in mind. Its focus is on how the research will eventually be used to change behavior. If this were done for a specific company, it would be consulting. More generally, it can be done to try and change general industry practices, lead to the passing of a state law on health care, or to increased participation in an employer savings plan. The targeted behavior may eventually lead to calorie labeling in fast food restaurants or how to use endowment theory to get children to finish their vegetables. 4. Activism Research is aggressively disseminated. Different research has different gatekeepers and different channels. This might mean presenting at companies and conventions, starting a blog and website, sending a direct-mail campaign to legislators, or visiting with congressional staffers. These efforts can be either top-down or bottom-up. When the research suggesting a tax on sugared beverages failed to get traction on the national level, the researchers began campaigning state governments, in order to develop a state level proof-of-concept. Activism research starts off with the end – changing behavior – in mind. The researcher may not know exactly what behavior should change in what way when the project begins, but the research starts with an additional purpose than simply being academically interesting. Activism research begins with the purpose of identifying a relevant problem for a specific group of people. It ends with disseminating that information or implementing an intervention with the intent of changing behavior. If changing behavior is an end goal, it is important to be able to take the time to visualize how this might happen (Murray, Ozanne, and Shipiro 1994). Five questions can be useful in helping accomplish this: 1) Who should use this, 2) what change could they make, 3) what’s a one-sentence take-away, 4 what independent variables are realistic, and 5) what would make this compelling (Wansink 2011). • What change could they make?Replace short, wide bar glasses with tall, thin ones to reduce alcohol pouring and over consumption. • What independent variables are realistic?Barware in sizes and shapes most commonly used by the largest casual dining chains. • What would make this compelling?Real bartenders in real bars in a real city (Philadelphia), who pour the 4 most commonly poured drinks into the most common glass sizes. Mapping out possible answers to these questions – even though the results of the study are not yet known – will direct the research design to be most potentially impactful. The answers can suggest a new context, a different population, or overlooked independent variables. Furthermore, being able to answer these questions also changes the way we think about the research and the way it will eventually be titled and disseminated. Mapping out these possible answers can also help in the positioning of the paper at the eleventh hour. As Table 4 illustrates initial tendency as scientists is to think of our research – and the title we give it – in very general terms. But instead of making our ideas widely used, this titling strategy can result in a title that is so banal and general that it instead makes the research widely ignored. As the sample titles in Table 4 illustrate, a second tendency is to think of our research – and title it – in a descriptive manner, generally one that show there’s a problem. That’s less activism research than pessimism research, and it generally gains less attention than a solution would. A third approach would be to challenge ourselves to think of what problem our research solves. Our papers – and our titles – then become prescriptive. They become a call for action. What follows are suggestions for thinking, conducting research, and writing with an activism mindset. The bullet points above offer suggestions on how to think about potential activism researchbeforewe begin it, and Table 4 offers suggestions on how to title and position our research afterit is completed. It would be useful, however, to have other rules of thumb that could guide use when conducting the research. Each of these suggestions offers twists on what many researchers currently do or feel natural doing. Still, even considering a couple changes could increase interest in a project, in one’s findings, or in helping disseminate them into practice. 1) Keep Asking and Refining a Useful but Nonobvious Question. Research answers to useful, nonobvious questions are both valuable and interesting – they capture both attention and imagination. There are three common sources many researchers use to develop their research questions: 1) The literature, 2) personal experiences, and 3) immersion and engagement within a consumer context.Basing one’s research question on the literature is perhaps the most common method academics use (Sheth and Sisodia 2005). It is the way we are trained in their PhD programs. We are trained to read the literature looking for gaps and for potential mediators and moderators that might apply to well-cited findings. Because the basic question is usually related to an existing question that has already been 95% successfully answered, a template exists that gives a researcher a head start on the literature, theory, and methods he or she will need to answer this new question. Other researchers use their own personal experiences to generate their research questions (see Levy 1996). This leads them to investigate questions such as those related to binge eating, food neophobia, dieting, and social facilitation. In some cases, answering the question is more of a personal matter to the researcher than it is a general issue relevant to others. Whereas the resulting answers can be interesting and relevant to others, that was not necessarily the intent when initially framing the question. Too often, the resulting answers have a degree of academic interest, but they can be too stylized and not intended to change behavior or to be disseminated to any particular stakeholder other than a journal. A third approach to developing research questions involves immersion and engagement within a consumer context (Whyte 1991). Being emerged in the consumer context enables these researchers to learn from people themselveswhat problems are most troubling to them. They learn this soup kitchens, grocery stores, restaurants, bars, and school cafeterias. It is in these contexts and with this knowledge that the appropriate research question can emerge, be appropriately framed, and eventually answered. In one case, observing daycare children during birthday parties suggested that extraverted children were much more likely to overeat candies and cereal when given larger serving plates and bowls (van Ittersum and Wansink 2014). In another case, an investigation of food waste in cafeterias indicated that when college cafeterias went trayless, they did not reduce food waste – they reduced beverage waste. Moreover, it reduced salad selection by 68% because people were more likely to take an entrée and dessert, but leave the salad if they could not carry it (Wansink and Just 2013). The resulting recommendation was not to eliminate trays, but to only reduce their size. When a useful, nonobvious research question comes being immersed in a vivid, everyday context, it’s solution is also likely to be more relevant and actionable than when it solely comes from a gap in the literature. Spending time with consumers also points toward independent variables that can practical and actionable to study and scalable to implement. There are additional benefits to immersion and engagement within the context: First, the research question is more likely to address a real problem suggested by experience than an academic problem suggested by the literature. Second, the independent variables being examined are most likely to be actionable and relevant. Third, the way in which the research is carried out is more likely to be realistic. Fourth, the language used in communicating the research will be relevant and actionable. For research to be actionable and relevant, it should be born from engagement with the target audience. It should involve real problems that suggest specific research questions with potentially clear, actionable solutions (Ozanne and Saatcioglu 2008). While the world cares about main effects, academics often focus overwhelmingly on interactions and mediation. Our focus on these subtleties – instead of on solving the research question – might often come at the expense of discovering and underscoring the main effect that could make the translational difference. A third order interaction is seldom as theoretically interesting as we lead ourselves to believe when we are detail-deep in our research. Yet that is what we can be tempted to focus on in our theorizing and discussion. It can often overwhelm the actual contribution. It is not uncommon for researchers to find the context in which a phenomenon does notwork, and then to focus on that context. Yet not starting with the right context can lead us down the road to irrelevance. It is often said that academics miss seeing the forest because we focus the trees. But even worse than that, we often miss seeing even the trees because we are staring at their bark. Becoming immersed in the context not only helps move to a more immediately relevant question, but it also provides a context for collecting compelling data. The “right data” are contextually-rich data. These are compelling and difficult to dismiss as irrelevant. This is exactly the type of data that many researchers do notwant to collect. Most highly productive social scientists are efficient at conducting undergraduate lab studies, computer-lab studies, complex modeling exercises, or short-term trials involving begrudging sophomores who need the extra credit (Sears 1986). When deciding to become academics, it was probably not so they could negotiate and conduct studies in restaurants, soup kitchens, grocery stores, and cafeterias. Yet this is where the right “contextually-rich” or “cool data” hides. It is data from real people in real situations that are being observed, coded, measured, and dispassionately analyzed and reported. Contextually rich data are difficult to collect. It can be difficult to get Institutional Review Board approval to collect the data. It be logistically complicated to staff and set up the studies, to debrief participants, and to analyze data that is disordered, incomplete, or miscoded because of the chaos that surrounded the study. Yet contextually-rich – or cool data – can capture imaginations. Cool results from cool data can suddenly make science relevant to an unsuspecting groups of people and they can almost always be published, eventually. Whereas “Too many cooks spoil the broth,” it is also said, “Many hands make light work.” In academia, as in other industrialized western professions, individualism is often admired more than partnerships. Despite this bias, the right partner can be the engine that funds, facilitates, implements, or disseminates our ideas and findings. No Programs Without Partners. Much of academic life is solitary. We learn to collect our own data, do our own debriefings, run our own analysis, write our own papers, and suffer alone from its initial rejection. Seeking an external partner is a strange, seemingly unnecessary notion for most scholars. The value of such a partnership is simply not obvious. Yet trying to disseminate research insights so they are widely translated is much easier with a partner. These partners can be a granting agency, the government, companies, or opinion-leading consumers. Let us consider four types of partners: 1) Funding partners who provide or help underwrite a project or support a researcher who’s risking a new idea. 2) Facilitating partners who aid the research process by helping collect data or providing data. 3) Implementation partners who help make the intervention work in its target population. 4) Dissemination partners who are information multipliers that help make sure the research is used in a way that changes behavior (Dyer and Shimp 1977). Having to sell a potential partner on the idea of joining with you on a project has its benefits. It sharpens one’s focus and vision of the project, it sharpens the anticipated end results, and it sharpens the benefits of the research itself. If we cannot find a partner that is equally passionate about our project, it may simply be because the project lacks the correct focus and precision. Yet it could also be because no one really cares about the problem we are trying to solve. In either case, it would be good to know where a project stands. The results could lead to a sharpened focus and value, or it could lead a researcher to move on to another more fruitful plan. Person-to-Person contact is Critical. In any research investigation, it is fundamentally important to interact with the user at the problem formulation and research design states. This personal contact is even more important in the public policy area. Many successful activism researchers tailor the study to the needs of the consumer or other decision makers. The perfect research study has little or no value unless the individual sees its value and its fit with their needs (cf. Wilkie and Gardner 1974). Partnerships can take many forms with many different stakeholders. Some partnerships can be useful in defining the right question and collecting the right data. Another set of partnerships can be useful in helping disseminate this data. As an example, the USDA sponsored a study to examine how payment systems, such as using debit cards, influenced the types of foods high school students purchased. While the relevant researchers and policy makers at the USDA were partners in initiating and eventually disseminating the research findings, five different sets of high school principles, food service directors, meal staff, and students were partners in helping determine the right question and in helping collect the right data. In past years, there has been increasing attention given to translational research in the health sciences. Whereas there is much that the social sciences could provide to changing health-related behavior, most studies are designed in ways that do not make their conclusions readily translatable. Activism research is an approach to help interested, externally-focused social scientists design lab and field studies that provide actionable solutions that are easily translatable to changing health-related behavior. There are small differences that distinguish social science research that has translatable results for health-related behavior from that which does not. These modifications will be easy for a willing researcher to make. One way we can generally and usefully show others how our research influences behavior is show how it fits in an understandable and more general framework of behavior change. One such framework is the CAN approach that was explained in the first part of this article. That is, we can show how our seemingly disparate set of interventions either make the healthy choice the one that is more convenient, attractive, or normal to make. It then gives public policy a full menu of options that can be used to push toward the same objective of encouraging healthy choices. The 19thCentury has been called the Century of Hygiene. That is, in the 19thCentury more lives were saved or extended due to an improved understanding of hygiene and public health than to any other single cause. The 20thCentury was the Century of Medicine. Vaccines, antibiotics, transfusions, and chemotherapy all helped to contribute to longer, healthier lives. In 1900, the life expectancy of an American was 49 years. In 2000, it was 77 years. The 21stcentury will be the Century of Behavior Change. Medicine is still making fundamental discoveries that can extend lives, but changing every day, long-term behavior is the key to adding years and quality to our lives. This will involve reducing risky behavior and making changes in exercise and nutrition. The more we exercise and the better we eat, the longer and more productively we will live. There is not a prescription that can be written for such behavior. Eating better and exercising more are decisions we need to be motivated to make. When it comes to contributing most to the life span and quality of life in the next couple generations, behavioral scientists could be well suited to effectively help us transform our behavior and the supporting behavior of restaurants, grocery stores, schools, and workplaces. Focusing on how much we eat would be a good place to start. Atalay, A. Selin, and Margaret G. Meloy. (2011): "Retail therapy: A strategic effort to improve mood." Psychology & Marketing28, no. 6 (2011): 638-659. Aydınoğlu, N. Z., & Krishna, A. (2011). Guiltless Gluttony: The Asymmetric Effect of Size Labels on Size Perceptions and Consumption. Journal of Consumer Research, 37, 1095-1112. Carels, R. A., Konrad, K., & Harper, J. (2007). Individual differences in food perceptions and calorie estimation: An examination of dieting status, weight, and gender. Appetite, 49, 450-458. Casazza, Krista, Andrew Brown, Arne Astrup, Fredrik Bertz, Charles Baum, Michelle Bohan Brown, John Dawson, Nefertiti Durant, Gareth Dutton, David A. Fields, Kevin R. Fontaine, David Levitsky, Tapan Mehta, Nir Menachemi, P.K. Newby, Russell Pate, Hollie Raynor, Barbara J. Rolls, Bisakha Sen, Daniel L. Smith, Diana Thomas, Brian Wansink, and David Allison (2014), “Weighing the Evidence of Common Beliefs in Obesity Research,” Critical Reviews in Food Science and Nutrition,55:14, 2014-2053. Chandon, P., & Wansink, B. (2002). When Are Stockpiled Products Consumed Faster? 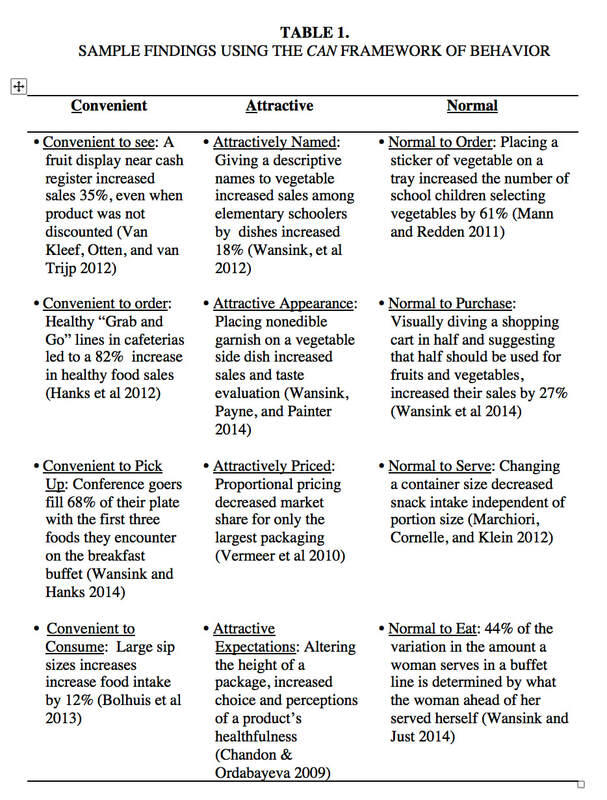 A Convenience--Salience Framework of Postpurchase Consumption Incidence and Quantity. Journal of Marketing Research, 39, 321-335. Chandon, P., & Wansink, B. (2006). How Biased Household Inventory Estimates Distort Shopping and Storage Decisions. Journal of Marketing, 70, 118-135. Chandon, P., & Wansink, B. (2007). The Biasing Health Halos of Fast-Food Restaurant Health Claims: Lower Calorie Estimates and Higher Side-Dish Consumption Intentions. Journal of Consumer Research, 34, 301-314. Cheema, A., & Soman, D. (2008). The Effect of Partitions on Controlling Consumption. Journal of Marketing Research, 45, 665-675. Chernev, A. (2011). The Dieter's Paradox. Journal of Consumer Psychology, 21, 178-183. Cornil, Y., & Chandon, P. (2013). Pleasure and Size: Gourmet, not Gourmand. Working Paper. Crum, A. J., Corbin, W. R., Brownell, K. D., & Salovey, P. (2011). Mind over milkshakes: Mindsets, not just nutrients, determine ghrelin response.Health Psychology, 30, 424-429. Dash, D. P. (1999), “Current Debates in Action Research,” Systemic Practice and Action Research,12(5), 457-492. Desai, Kalpesh Kaushik, and Debabrata Talukdar. (2003): "Relationship between product groups' price perceptions, shopper's basket size, and grocery store's overall store price image." Psychology & Marketing20, no. 10 903-933. Dyer, Robert F. and Terence A. Shimp (1977), “Enhancing the Role of Marketing-Research in Public-Policy Decision-Making,” Journal of Marketing,41(1), 63-67. Finkelstein, Stacey R., & Fishbach, A. (2010). When Healthy Food Makes You Hungry. Journal of Consumer Research, 37, 357-367. Fischler, C., Masson, E., & Barlösius, E. (2008). Manger : Français, Européens et Américains face à l'alimentation. Paris: O. Jacob. Gardner, Meryl P., Brian Wansink, Junyong Kim, and Se-Bum Park (2014), “Better Moods for Better Eating? How Mood Influences Food Choice, Journal of Consumer Psychology,24:320-335. Garg, N., Wansink, B., & Inman, J. J. (2007). The Influence of Incidental Affect on Consumers' Food Intake. Journal of Marketing, 71, 194-206. Geier, A., Wansink, B., & Rozin, P. (2012). Red potato chips: Segmentation cues can substantially decrease food intake. Health Psychology. Grunert, K. G., Bolton, L. E., & Raats, M. M. (2011). Processing and acting upon nutrition labeling on food: The state of knowledge and new directions for transformative consumer research. In D. G. Mick, S. Pettigrew, J. L. Ozanne & C. Pechmann (Eds. ), Transformative Consumer Research for Personal and Collective Well-Being(pp. 333-351). New York: Routledge. Hanks, AS, Just DR, Smith LE, Wansink B. Healthy convenience: Nudging students toward healthier choices in the lunchroom. J Public Health2012;34:370-376. Hanks, Andrew S., David R. Just, and Brian Wansink (2014), “Chocolate Milk Consequences: A Pilot Study Evaluating the Consequences of Banning Chocolate Milk in School Cafeterias,” PLoS One,10.1371/journal.pone.0091022. Hansen, Torben, and Thyra Uth Thomsen. (2013): "I Know What I Know, but I will Probably Fail Anyway: How Learned Helplessness Moderates the Knowledge Calibration–Dietary Choice Quality Relationship." Psychology & Marketing30, no. 11 1008-1028. Hauser, Mirjam, Fridtjof W. Nussbeck, and Klaus Jonas. (2013): "The Impact of Food‐Related Values on Food Purchase Behavior and the Mediating Role of Attitudes: A Swiss Study." Psychology & Marketing30, no. 9 765-778. Hantula, Donald A. (2003): "Guest editorial: Evolutionary Psychology and consumption." Psychology & Marketing20, no. 9 757-763. Hetherington, M. M., Anderson, A. S., Norton, G. N. M., & Newson, L. (2006). Situational effects on meal intake: A comparison of eating alone and eating with others. Physiology and Behavior, 88, 498-505. Higgs, S. (2008). Cognitive influences on food intake: The effects of manipulating memory for recent eating. Physiology and Behavior, 94, 734-739. Higgs, S., & Woodward, M. (2009). Television watching during lunch increases afternoon snack intake of young women. Appetite, 52, 39-43. Hoegg, J., & Alba, J. W. (2007). Taste Perception: More than Meets the Tongue. Journal of Consumer Research, 33, 490-498. Irmak, C., Vallen, B., & Robinson, S. R. (2011). The Impact of Product Name on Dieters' and Nondieters' Food Evaluations and Consumption. Journal of Consumer Research, 38, 390-405. Just DR, Wansink B. Better school meals on a budget: Using behavioral economics and food psychology to improve meal selection. Choices2009;24:1-6. Keller, Punam (2008), ”Presidential Adress,” Advances in Consumer Research, Volume 32, pp. 1-7. Khare, A., & Inman, J. J. (2009). Daily, Week-Part, and Holiday Patterns in Consumers' Caloric Intake. Journal of Public Policy & Marketing, 28, 234-252. Kozup, J. C., Creyer, E. H., & Burton, S. (2003). Making Healthful Food Choices: The Influence of Health Claims and Nutrition Information on Consumers' Evaluations of Packaged Food Products and Restaurant Menu Items. Journal of Marketing, 67, 19-34. Laroche, Helena H., Christopher Ford, Kate Anderson, Xueya Cai, David R. Just, Andrew S. Hanks, and Brian Wansink (2014), “Concession Stand Makeovers: A Pilot Study of Offering Healthy Foods at High School Concession Stands,” Journal of Public Health, doi: 10.1093/pubmed/fdu015. Lee, L., Frederick, S., & Ariely, D. (2006). Try It, You'll Like It: The Influence of Expectation, Consumption, and Revelation on Preferences for Beer. Psychological Science, 17, 1054-1058. Lowe, Ben, Diogo Souza-Monteiro, and Iain Fraser (2013), “Exploring the Role of Technology in Consumer Processing of Nutritional Information,” Prepublished online Journal of Marketing Management. DOI: 10.1080/0267257X.2013.798673. Marchiori, D., Corneille, O., & Klein, O. (2012). Container size influences snack food intake independently of portion size. Appetite, 58, 814-817. McFerran, B., Dahl, D. W., Fitzsimons, G. J., & Morales, A. C. (2010a). I'll Have What She's Having: Effects of Social Influence and Body Type on the Food Choices of Others. Journal of Consumer Research, 36, 915-929. McFerran, B., Dahl, D. W., Fitzsimons, G. J., & Morales, A. C. (2010b). Might an overweight waitress make you eat more? How the body type of others is sufficient to alter our food consumption. Journal of Consumer Psychology, 20, 146-151. Mick, David Glenn (2005), ”Meaning and Mattering Through Transformtive Consumer Research, Advances in Consumer Research, Volume 33, Provo, UT: Association for Consumer Research.1-9. Moorman, C., Ferraro, R., & Huber, J. (2012). Unintended Nutrition Consequences: Firm Responses to the Nutrition Labeling and Education Act. Marketing Science, Forthcoming. Musicus, Aviva, Aner Tal, and Brian Wansink (2014), “Eyes in the Aisles: Why is Cap’n Crunch Looking Down at my Child?,” Environment & Behavior,47:7 (August), 715-733. Nies, Salome, and Martin Natter. (2012): "Does Private Label Quality Influence Consumers’ Decision on Where to Shop?." Psychology & Marketing29, no. 4 279-292. Nocella, Giuseppe, Andreas Boecker, Lionel Hubbard, and Riccardo Scarpa. (2012): "Eliciting Consumer Preferences for Certified Animal‐Friendly Foods: Can Elements of the Theory of Planned Behavior Improve Choice Experiment Analysis?." Psychology & Marketing29, no. 11 850-868. Olsen, Svein Ottar, and Huynh Thi Xuan Mai. (2013): "Consumer participation: The case of home meal preparation." Psychology & Marketing30, no. 1 1-11. Ozanne, Julie L. and Bige Saatcioglu (2008), “Participatory Action Research,” Journal of Consumer Research,35(3), 423-439. Parmar, Neil (2007), “10 Things Your Bartender Won’t Tell You,” Smart Money, (July), 31-32. Phillips, Diane M., and William K. Hallman. (2013): "Consumer Risk Perceptions and Marketing Strategy: The Case of Genetically Modified Food." Psychology & Marketing30, no. 9 739-748. Plassmann, H., O'Doherty, J., Shiv, B., & Rangel, A. (2008). Marketing actions can modulate neural representations of experienced pleasantness. Proceedings of the National Academy of Sciences of the United States of America, 105, 1050-1054. Polivy, J., & Herman, C. P. (2002a). Causes of eating disorders. Annual Review of Psychology, 53, 187-213. Provencher, V., Polivy, J., & Herman, C. P. (2008). Perceived healthiness of food. If it's healthy, you can eat more! Appetite, 52, 340–344. Raghubir, P., & Krishna, A. (1999). Vital Dimensions in Volume Perception: Can the Eye Fool the Stomach? Journal of Marketing Research, 36, 313-326. Roberts, Michele and Simone Pettigrew (2013), Psychosocial Influences on Children's Food Consumption, Psychology & Marketing, 30:2, 103–120. Sears, David O. (1986). College sophomores in the laboratory: Influences of a narrow data base on psychology’s view of human nature. Journal of Personality and Social Psychology, 51, 515-530. Sharpe, Kathryn M., Staelin, R., & Huber, J. (2008). Using Extremeness Aversion to Fight Obesity: Policy Implications of Context Dependent Demand. Journal of Consumer Research, 35, 406-422. Sheth, J. N., & Sisodia, R. S. (2005). A dangerous divergence: Marketing and society. Journal of Public Policy and Marketing, 24, 160-162. Shimp, Terence A. (1994), “Academic Appalachia and the Discipline of Consumer Research,” Advances in Consumer Research, Volume 21, 1-7. Shiv, B., & Nowlis, S. M. (2004). The Effect of Distractions While Tasting a Food Sample: The Interplay of Informational and Affective Components in Subsequent Choice. Journal of Consumer Research, 31, 599-608. Spence, Charles, and Alberto Gallace. (2011). "Multisensory design: Reaching out to touch the consumer." Psychology & Marketing28, no. 3 267-308. Steenhuis, I., & Vermeer, W. (2009). Portion size: review and framework for interventions. International Journal of Behavioral Nutrition and Physical Activity, 6, 58-67. Stroebele, N., & De Castro, J. M. (2004). Effect of ambience on food intake and food choice. Nutrition, 20, 821-838. Van Ittersum, K., & Wansink, B. (2012). Plate Size and Color Suggestibility: The Delboeuf Illusion’s Bias on Serving and Eating Behavior. Journal of Consumer Research, 39, 215-228. Van Ittersum, Koert and Brian Wansink (2013), “Extraverted Children are More Biased by Bowl Sizes than Introverts,” PLoS One, 8:10, e78224. Vega‐Zamora, Manuela, Francisco José Torres‐Ruiz, Eva Mª Murgado‐Armenteros, and Manuel Parras‐Rosa, (2014): "Organic as a Heuristic Cue: What Spanish Consumers Mean by Organic Foods." Psychology & Marketing31, no. 5 349-359. Vermeir, Iris, and Patrick Van Kenhove. (2005): "The influence of need for closure and perceived time pressure on search effort for price and promotional information in a grocery shopping context." Psychology & Marketing22, no. 1 71-95. Wansink, Brian and Pierre Chandon (2014), "Slim by Design: Redirecting the Accidental Drivers of Mindless Overeating," Journal of Consumer Psychology,24:413-431. Wansink, Brian and David R. Just (2013), “Trayless Cafeterias Lead Diners to Take Less Salad and Relatively More Dessert,” Public Health Nutrition, doi:10.1017/S1368980013003066. http://journals.cambridge.org/action/displayAbstract?fromPage=online&aid=9073711. Wansink, Brian and Koert van Ittersum (2014), “Portion Size Me: Plate Size Can Decrease Serving Size, Intake, and Food Waste,” Journal of Experimental Psychology: Applied, Vol 19(4), Dec 2013, 320-332. Wansink, Brian and Wansink, Brian and Katherine A. Johnson (2015), “The Clean Plate Club: About 92% of Self-Served Food is Eaten,” International Journal of Obesity, 39: 371-374. Wansink, B. (1996). Can package size accelerate usage volume? Journal of Marketing, 60, 1-14. Wansink, B. (2004). Marketing Nutrition. Champaign, IL: University of Illinois Press. Wansink, B., & Van Ittersum, K. (2003). Bottoms Up! The Influence of Elongation on Pouring and Consumption Volume. Journal of Consumer Research, 30, 455-463. Wansink, B., van Ittersum, K., & Painter, J. E. (2006). Ice Cream Illusions: Bowls, Spoons, and Self-Served Portion Sizes. American Journal of Preventive Medicine, 31, 240-243. Wansink B. Mindless Eating – Why We Eat More Than We Think. Bantam Dell: New York, 2006. Wansink B, Sobal J. Mindless Eating: The 200 daily food decisions we overlook. Environment & Behavior2007;39:106-123. Wansink B. Slim By Design – Mindless Eating Solutions for Everyday Life. William-Morrow: New York, 2014. Wansink, Brian (2011), “Activism Research:Designing Research that Intends to Transform,” Transformative Consumer Research for Personal and Collective Well-Being, eds. David Mick, Simone Pettigrew, Connie Pechmann, and Julie Ozanne, New York: Taylor & Francis/Routledge, 67-88. Wansink B, Just DR, Hanks AS and Smith Pre-sliced fruit in schools increases selection and intake. Am J Prev Med2013;44:477-480. Wansink B, Just DR, Payne CR, and Klinger MZ. Attractive names sustain increased vegetable intake in schools. Prev Med2012;55:330-332. Wansink B, Just DR, Payne CR. Can branding improve school lunches? Arch Pediatr Adolescent Med 2012;166:967-968. Wansink, Brian (2013), “Convenient, Attractive, and Normal: The CAN Approach to Making Children Slim by Design, Childhood Obesity, 9:4 (August), 277-278. Werle, C. O. C., Ardito, G., Trendal, O., Mallard, A., & Nat, P. (2011). Unhealthy Food is Not Tastier for Everybody: The “Healthy=Tasty” French Intuition. Actes du Congrès de l'AFM. Westerterp-Plantenga, M. S., van Marken Lichtenbelt, W. D., Cilissen, C., & Top, S. (2002). Energy metabolism in women during short exposure to the thermoneutral zone. Physiology and Behavior, 75, 227-235. Wilcox, K., Vallen, B., Block, L., & Fitzsimons, Gavan J. (2009). Vicarious Goal Fulfillment: When the Mere Presence of a Healthy Option Leads to an Ironically Indulgent Decision. Journal of Consumer Research, 36, 380-393. Whyte, William Foote (1991), Participatory Action Research,Sage focus edition,Newbury Park, Calif.:Sage Publications. Wilkie, William L. and David M. Gardner (1974), “The Role of Marketing Research in Public Policy,” Journal of Marketing, 38:1, 46. Xie, Chunyan, Richard P. Bagozzi, and Jens Østli. (2013): "Cognitive, Emotional, and Sociocultural Processes in Consumption." Psychology & Marketing30, no. 1 12-25. Young, Lisa and Marion Nestle (2002), “The Contribution of Expanding Portion Sizes to the US Obesity Epidemic,” American Journal of Public Health, 92, 246.